At Fulks Family Dental, we are committed to offering the highest-quality dental service, including using the latest dental technology. Our goal is to ensure the most accurate dental diagnosis and then be able to explain your current dental situation to you easily and efficiently. 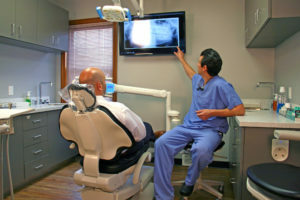 Some of the advanced technology we use includes touch-screen computers, digital x-rays, and our intraoral cameras. Digital x-rays are pictures taken inside of your mouth using a sensor. These x-rays offer better quality and color development than conventional x-rays, which means that your dental team has a clearer picture of your dental condition. This allows for a quick and accurate diagnosis. Digital x-rays also use 70 percent less radiation and are developed instantaneously on a computer screen. Instead of waiting for traditional film x-rays to be developed, your x-rays appear immediately, resulting in more efficiency during your visit. Results may be stored on touch screen computers so that your records are available at your dentist’s fingertips. And, we can easily share your x-rays with you to explain your diagnosis effectively and offer treatment options. An intraoral camera is the shape of a pen and contains a small lens that can be moved around your mouth easily during a dental exam. It takes specific pictures of places where a dentist suspects a problem. The images may be manipulated so that the best diagnosis can be made for you. With an intraoral camera, patient and doctor interaction is maximized. The results allow us to show you exactly what is happening inside of your mouth and explain the best course of treatment. And, because pictures are easy to print and store in your file, we have full records of everything we find. This makes any referrals you need easier as well, as we can send all of your detailed information to any specialist. At Fulks Family Dental, we want to make each visit as simple and enjoyable for every patient as possible. By using advanced technology in our office, patients receive top-notch care in a relaxed environment. Problems are detected earlier, and records are easily stored. Take advantage of the latest developments we have so that your oral care is maximized. Schedule an appointment or call us for more information today!